Why would Vesta Elizabeth Svenson, a retired judge working part-time as a Wayne County magistrate, set low bond for an accused Mexican drug-runner who police say admitted his role? Detroit Police Chief James Craig is among those who wonder. "It's an outrage," he says, as George Hunter posts at The Detroit News. "I'm deeply disappointed that someone who commits a crime of this magnitude -- in addition to being a foreign national, which makes him a tremendous flight risk -- is allowed back on the street for $200," Craig said. The chief reacts to the disappearance of 24-year-old Jose Antonio Lopez, a fugitive who skipped a 36th District Court hearing 10 days after Swenson aarraigned him on two felony charges at 34th District Court in Romulus. She was handling weekend proceedings from around the county March 2, a Saturday when 36th District Court downtown was shut. 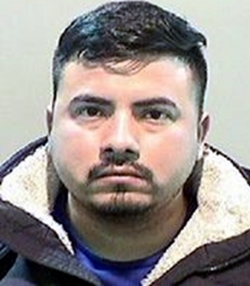 Detroit narcotics detectives nabbed the accused smuggler late last month at a west-side home with 4.6 kilos of heroin and 2 kilos of cocaine hidden in his car, according to police. Despite the confession, the severity of the charges and Lopez's status as a non-U.S. resident, visiting magistrate Vesta Swenson set bond at $2,000/10 percent. The defendant posted the $200 needed to get out of jail and fled. Svenson, an 81-year-old retired 36th District Court judge, lives in Detroit's Indian Village area, graduated from Wayne State Law School in 1971 and was admitted that fall to the State Bar of Michigan, online databases show. She was appointed as an "attorney magistrate" on Jan. 31, 2014 by Nancy M. Blount, chief judge at 36th District Court, according to a four-page administrative order listing her responsibilities "under the Wayne County multi-district plan for weekends and holidays." She's an off-hours substitue on the bench, in other words. Detroit arraignments are handled by the city's 36th District Court, except on weekends when the docket is handled in the suburban facility -- usually with a visiting judge who isn't familiar with the case. "Saturday bonds have been a problem," Assistant Detroit Police Chief David LeValley said. "We have historically been seeing low bonds on the weekends — sometimes absurdly low for the crimes being charged." During the week, assistant prosecutors and police often attend arraignments involving defendants who are considered flight risks to advocate for high bonds or jail remands. But Wayne County prosecutor Kym Worthy has said she doesn't have the manpower to send assistant prosecutors to the court on weekends. "Going forward, we want to get high-risk defendants arraigned on weekdays," assistant prosecutor Maria Miller said. In the matter of Jose Lopez, frustrated detectives figure he's back home in Mexico and beyond their reach.